Draw 3 to discard 2 is often worse than thirst, but not the worst in the world. At sorcery speed is bad, really bad, but at least it cantrips. 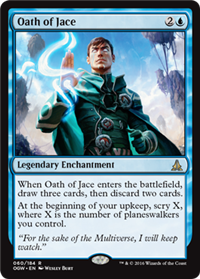 However it has a second ability, really nice even with just 1 planeswalker, but current played pw already do card filtering, or even card advantage, so this is a bit redundant. Playable in superfriends? I don't think so, but it's interesting at least. I consider the play trigger the main effect and the scry just a very minor bonus -- the scry is the textbook definition of win-more. 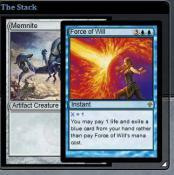 That leaves this card as a really bad TfK; playable in Standard, maybe, but not here. I'll stick to the Oath that costs . You already have Planeswalker in a play.Isn't it enough? How scary the name of the card is. But its probably just fine. More excuses for me to sleeve up my Miracles! For the same price and same main effect, I'd much rather play this. The kicker would be relevant more often than the Scry 1. 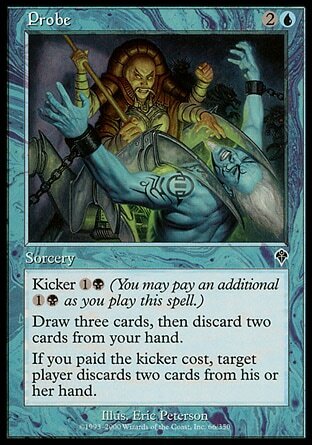 If there were a deck that had a real reason it would need both a thirst effect and an enchantment/permanent in play then maybe this could see play, but since serra's sanctum is not blue mana it seems like a stretch. Based on Nissa's oath being spoiled though, I would not be shocked to see a viable card come out of the cycle. Heck the Nissa one is almost playable since it is not in blue and green does not have effects like that with few exceptions.